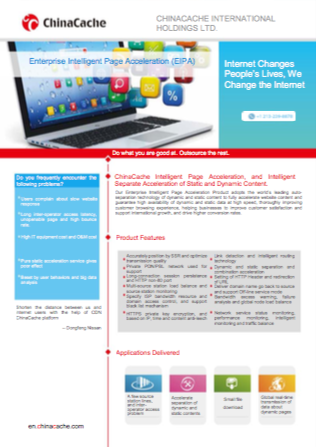 Enterprise Intelligent Page Acceleration (EIPA) is our interactive content acceleration product. It is designed to optimize whole-site performance by accelerating dynamic content back to the customer’s origin while serving static content from local edge servers. Websites today are delivering a wide array of content in real-time, generating a substantial need for adaptable acceleration. EIPA is built to intelligently detect the health status between the end-user and the content source and choosing the best route to deliver the content. Fill out the form to receive the full product sheet. Need a trusted partner in China?